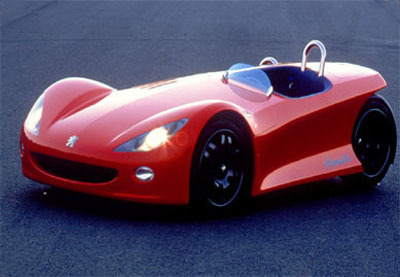 The Peugeot Asphalte is a concept designed purely for the sports car enthusiast. 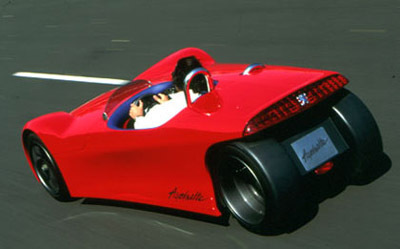 The Asphalte's unusual tapering body with inset rear wheels was originally intended to house three wheels, however to improve performance and reliability the designers added a fourth. Consequently the Asphalte is the only car in the world which when viewed from behind, reveals its four wheels. Peugeot designed the Asphalte to magnify the driving experience and as such the concept sits just centimeters from the floor, and the passengers are protected by only a small wind deflector. The Asphalte's interior makes room for either a driver and passenger or just the driver  the passenger seat can be hidden. The driver has full adjustment over the steering wheel and pedals to make the interior feel even more like a cockpit. 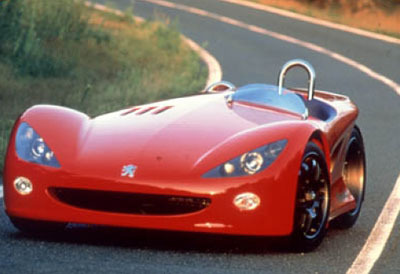 Almost 10 years after the Asphalte appeared, Peugeot revived the spirit of the concept with the 2005 concept Peugeot 20Cup seen at the Frankfurt Auto Show. A true three wheeler with more than a hint of Asphalte style.